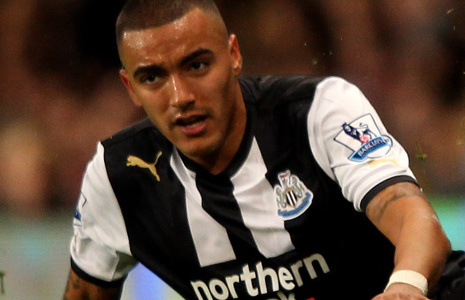 Is Danny Simpson really good enough to start for Newcastle? Words by Kevin Doocey on February 27, 2012 . You would have to credit Danny Simpson with the fantastic point Newcastle United managed at Old Trafford against Manchester United earlier in the season, after he clawed what seemed a net destined header, off the line. In fact, his position on the line has saved Newcastle United goals this season. However, it seems to me that with every game that passes - Simpson looks increasingly average and surely isn’t one of the first names on Alan Pardew’s matchday teamsheet? He is a vulnerability down the right - often getting caught out of position, and failing to keep pace with some of the tricky wingers he has come up against this season. Add to that the news that he will not sign a new and improved contract, which more than doubles his current wage. I think it’s time to move Danny on, while we can. Our RB position isn’t one where there is an awful lot of competition to be fair - Simpson has played any time he’s been fit, which is a bit worrying. He did have a great Championship season, and a solid Premier League campaign last time out but there are better players than him out there, for reasonable prices. Whether the reported personal problems in his life are affecting his performances I’m not quite sure and it’s none our business. However, once he walks over the white line - then you expect 100%, and for him to leave any private life issues in he dressing-room (but nowhere near Cheik). With that said - a lot of people have complained about Simpson since last season, claiming that he is no more than a nPower Championship defender at best. That is a tad harsh, but I’m not sure he is good enough to start for Newcastle United any longer. Nathaniel Clyne is a summer target, and enquiries will be made when the window re-opens - you can be sure of that. However, depending on the asking price; NUFC may turn their attentions to France (for a change) with Mapou Yanga-Mbiwa a likely target. The Central African Republic born player can play anywhere across the back four, which would be a welcomed addition to Alan Pardew’s squad. As well as that - James Tavernier is reportedly highly rated among the Newcastle hierarchy, and we could see him in action in a Black and White shirt before too long, and perhaps after he returns from his loan. Of course added to Tavernier - Ryan Taylor can play in the RB position, but I doubt that we will see the Englishman slot in there unless injuries hit us hard, and we certainly hope that doesn’t happen. Maybe it’s a bit harsh on Danny, and he might just be going through a bad patch at the minute, but in my professional opinion at least - he needs to at least face competition for that right-back position. What do you guys think? Does he merit his starting place? No he's not, apart from a goal line clearance he's awful. Ryan Taylor RB Santon LB. sorted!! Simpson show commitment from time to time but also and Shola... This isn't enough. He must go and we must buy some more than decent full back... and nail Railor with new contract. He is versatile and good for back up. I think you are spot on, he is the weak link in our team for sure in my opinion. Positionally awful, backs off his man all the time and doesn't stop crosses/shots coming in as displayed with the first goal on Saturday. Dont know if its a right back thing but he seems to do the old Stephen Carr thing too of blaming everyone else whenever he drops a clanger. Can't believe there is a 5 year deal on the table for him and strangely I can't believe he hasn't signed it as im baffled as to where he thinks he can go better than what he has at the moment. Short term I would either play Ryan there or move Santon across and play Ryan or Ferguson at left back but long term we surely have to be able to bring someone in better? The clearances off the line thing just papers over the cracks too - lets be honest most of the time that is down to the luck of the ball hitting you rather than any kind of skill or judgement. Personally I'd have Santon at right back and Ferguson on the left - when playing at home. Santon and Ben Arfa on the right would make a formidable pair. as would fergie and Jonas on left. I think you'll find Obertan was never a scape-goat on this site! Simpson unfortunately for me, has had too many poor games this season. As mentioned below, he tends to allow a huge amount of crosses into the box - and to be quite frank, his own delivery leaves a little to be desired. True about Williamson on Saturday though - had a poor game, and not his first ever poor one either. Lot of people fancying Santon at RB - personally not sure how he'd fare. Behind Ben Arfa, and supporting him could be quality though for sure. Thing about Santon, his LB position allows him to drive down the wing, take on left-backs, cut in and have a smack or deliver a good ball which is refreshing to see. If Ferguson ready for first team football though?